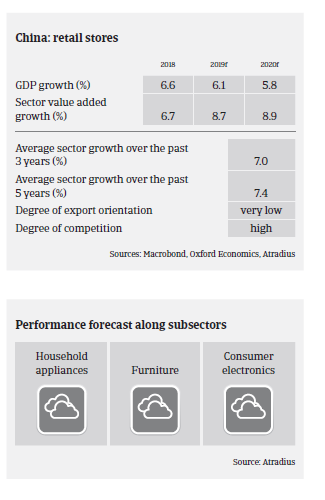 Despite a forecast slowdown of GDP growth in 2019 to about 6%, consumer durables sales are expected to remain stable. Following 6.9% growth in 2018 private consumption is forecast to grow 6.8% in 2019 supported by tax cuts to sustain economic growth. While the growth potential for offline sales is increasingly limited, the average annual growth rate of online sales is above 25%. Profit margins of consumer durables retailers in the online segment are expected to increase slightly in 2019, while brick-and-mortar retailers face continued pressure on their margins. Sales in the household appliances segment are expected to remain robust, but stiff competition keeps profit margins of smaller players at a low level, while larger companies usually show healthy margins. In the consumer electronics segment the fierce competitive environment keeps margins of most businesses at a low level. In general, the gearing of consumer durables retailers is not overly high, and banks are principally willing to provide loans. Payments in the sector take 30-60 days on average, and payment behaviour has been good over the past two years. The current level of non-payment notifications is average, and payment delays as well as insolvencies are not expected to increase in 2019. Our underwriting stance for large consumer durables retailers and businesses with good financial performance is generally open. However, we are more cautious with smaller businesses, and restrictive with companies that are highly geared and have a weak market position. In the furniture segment we are cautious with businesses exporting to the US due to the ongoing trade dispute. The same accounts for the textiles segment due to overcapacity.